End of Year Wrap Up -- New Year Endeavor! Well, that year could have gone… so much better. Real Life went pretty well – very well, actually, especially compared to recent years; but 2018 was really not my year for gaming, neither for playing games nor writing about them. There’s been no specific reason for the lack of either, though “time really wasn’t on my side” and “didn’t have the gumption to make it happen anyway” come to mind as twin dooms. 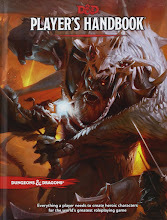 In the last few years I’d mostly been running Dungeons & Dragons 5E, and in general, I’ve found it lacking. It just does not maintain the pizazz for me that Labyrinth Lord and other OSR games engender, and so my desire to run it simply faded over time. And it was not enough to overcome the scheduling issues that developed this year with Jodi’s job, such that our only time together for most of the last six months generally coincided with the times the bulk of the group could play… so it goes. As for writing, well, I’ve just not been that inspired. Usually, a lack of gaming inspires me to write about gaming, seeking an outlet for those energies. That just didn’t happen. There was a brief period when that changed, however, and I was gearing up to start a whole new project… but then came the announcement of the end of G+, the essential home of the OSR, at the same time that the OSR started to completely implode in political foofaraw, and so rather than gamble time and treasure on an untried product even as the market was shifting, I decided to shelve the work and see how things develop. Once burned, twice shy as they say. But some of that renewed energy still is burning in my craw, so I want to do something with it. 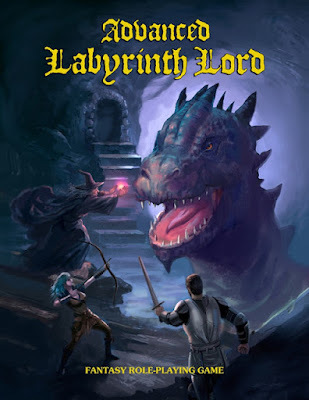 With the release of the Advanced Labyrinth Lord tome [Dragon Cover | Orcus Cover], I plan to do something to build on that. I am going to endeavor to return again to posting on this blog on a regular schedule – Tuesday-Friday to start out, maybe to move to Monday-Wednesday-Friday in time. 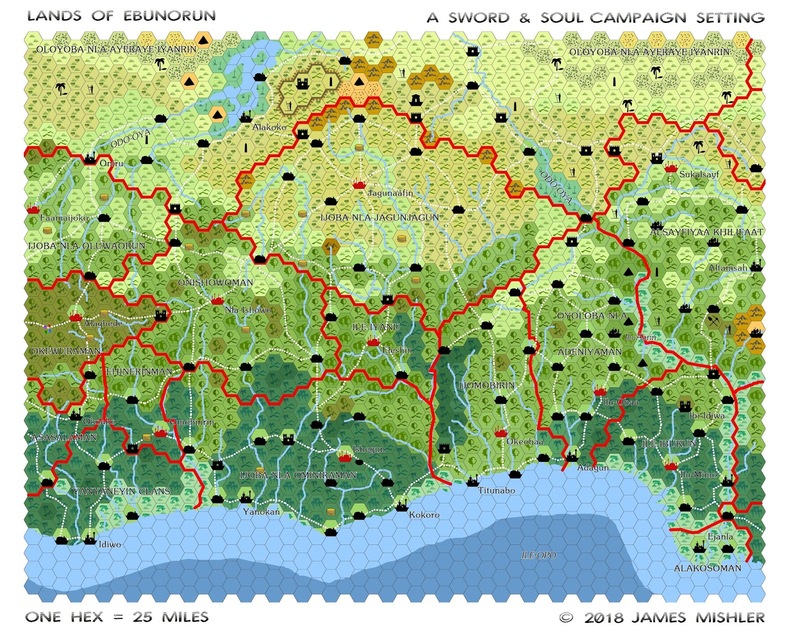 I want to return again to posting interesting, useful content, the kinds of things I would use to run my own game and build a campaign… with the hope in time to actually start running said campaign. 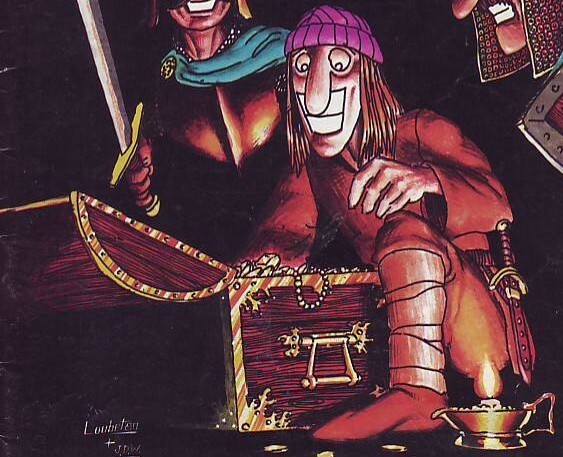 Return back to the roots, so to speak, of the OSR in its DIY phase, rather than wallow in the post-apocalyptic obsessive navel-gazing stage of the day. So that will start on Tuesday; new year, new endeavor. I missed Free RPG Day due to other commitments, but got to run a two-player Dungeon Crawl Classics funnel on Monday night. I ran the party through the classic The Portal Under the Stars adventure. We used the Alternate Occupations supplement from IDD. Ryan the Fortuneteller used his Tarot Deck to gain advice on how to proceed once they discovered the locked door in room 1. He rolled a Nat 20, so he got the advice to “Wait,” and so they did and entered the dungeon without incident. Brian the Linkboy got a gut-shot with a spear in room #2. Seth the Mummer got blasted by fire in room #3. Richard the Cultist was crushed by a falling statue in room #3. Ryan the Fortune Teller and Paul the Cheesemaker burned to death in the conflagration that followed the toppling of the statue in room #3. 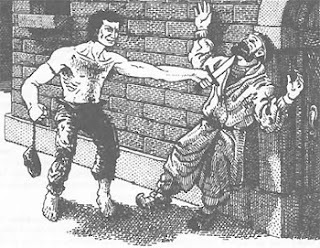 Zack the Smuggler was bitten to death in room #4. Harry and Thomas actually killed the beast in #4 and fled the dungeon with the demon horn and 4 XP each. Goblinoid Games has finally launched the Advanced Labyrinth Lord Kickstarter! Labyrinth Lord was first published in 2007, and for over 10 years has been one of the premier old-school "retro-clone" games. 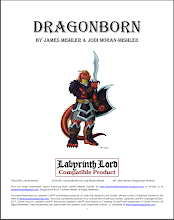 Its wildly popular supplement, the Advanced Edition Companion, adds all of the "advanced" first edition options for Labyrinth Lord, all while keeping compatibility with the B/X basic fantasy game. There are 4 cover options available to backers. The first two will be available after this Kickstarter campaign is over, but the other two are limited and available in this Kickstarter only! These last two covers hearken back to earlier cover versions of Labyrinth Lord. In addition, for the first time ever and only available now, Realms of Crawling Chaos is presented in hard cover format as a backer add-on! 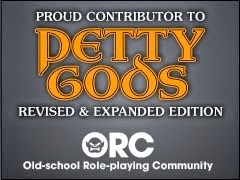 Click here to go to the Advanced Labyrinth Lord Kickstarter! Sifting through some old disks, I found an old alternate Thieves Skill system I worked on some years ago. 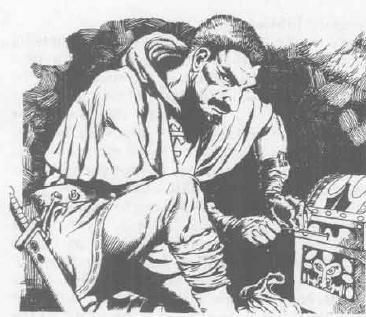 It combined elements from Labyrinth Lord, 2E AD&D, and Warlock. The thief chooses eight skills at 1st level from the following list. Each starts at 20%. At 1st level the thief gains 120 points to assign as she wishes, no more than 60 points to any one skill. Plus, an additional number of points equal to the greater of her Dexterity, Intelligence, or Charisma score, which can be divided up or assigned in a single block. Every level thereafter she gains 40 points, no more than 20 points of which can be placed into a single skill. She can also choose to gain a new thief skill, but it must start at 20 points. ACROBATICS: Use of this ability includes performing tumbles, flips, handstands, tightrope walking, rope swinging, and so forth. Use to entertain is generally relatively easy unless the stunt is complicated, while use during combat is often difficult and requires penalties even under the best of circumstances. ARSON: This ability enables the Thief to quickly start fires, assure that fire goes where desired and at the speed desired, burn specific buildings or sections of buildings as appropriate, and so forth, including the detection of an arson job by another arsonist. This skill also enables the Thief to properly and (usually) safely manufacture and handle Greek Fire as well as various fire accelerants. BLUFF: This broad skill includes all forms of con games (both long and short con), lies, deception, persuasion, diplomacy, haggling, and bargaining. CLIMB: This skill includes climbing trees, ship masts and nets, slopes, walls, sheer surfaces, overhangs, and the proper use of ropes, grapnels and grappling hooks, pitons, and other such equipment. DECIPHER: This skill includes the deciphering of ancient and modern scripts, alchemist and magic-user codes, maps and map symbols, and the memorization and recollection of the same. Special: At 90 and above, this skill can be used to read magic-user scrolls and cast the spells thereupon. DISGUISE: Use of this skill enables the Thief to disguise himself to appear as a generic being of the same or even a different race, or even specific individuals. This skill includes modification of physical appearance, plus mimicry of voice and vocal traits, physical mannerisms, and memorization and application of the “targets” specific personal affairs and knowledge (requires extensive observation for long-term disguise). ENTERTAIN: This skill provides the Thief with in-depth knowledge of and performing abilities in a single sort of entertainment, as well as broad general knowledge of all sorts of medieval entertainment. Possibilities include: musical instrument (specific type), singing, dancing, sword swallowing, mummery, stage magic, puppetry, animal training, buffoonery, and so forth. Special: At 90, 95, and 99 each, the Thief gains in-depth knowledge of another single sort of entertainment. ESCAPE: Successful application of this skill allows the Thief to escape from personal body restraints such as cuffs, shackles, ropes, chains, straitjacket, and so forth; picking locks requires the use of the Locksmith ability, and some of the more complicated and diabolical of these devices require multiple rolls of both skills! GAMBLING: This skill includes the theoretical knowledge of and practical playing skills in various games of skill and chance; it can be applied to regular game play as well as to cheating, and to the detection of other player’s cheating. 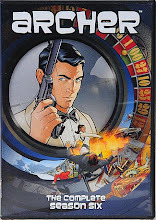 With games of skill it can be applied as normal, and cheating can up to double the relative skill level of the player, while with games of chance the application of this kind of skill is essentially only in cheating (slipping in weighted dice, using marked cards undetected, etc.) 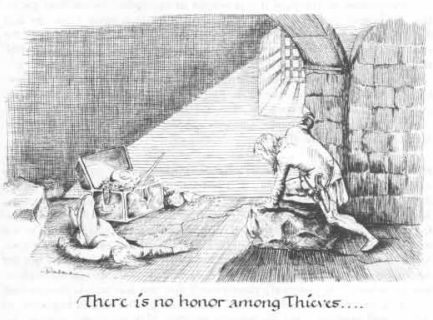 to weigh the game’s chances in the Thief’s favor. HIDE IN SHADOWS: This skill includes hiding in shadows, camouflaging one self in difficult backgrounds, and so on. In order to “slip into nearby shadows” from direct visual sight, the Thief must provide some sort of distraction, perhaps using Slight of Hand, Bluff, a smoke bomb, or some similar skill or device. Any attempt to Hide while moving at half or less normal Speed results in half the normal chances; moving faster than half normal Speed results in merely one-quarter the normal skill chance (all rounded down)! INTIMIDATE: Similar to Bluff, this skill is used to get people to do what you want… by any means necessary. Application of this skill is both physical and mental, and at higher levels includes intimate knowledge of the finer methods and application of torture. LISTEN: This skill subsumes all listening at doors, hearing and discerning noises down a corridor or pit, and listening in on a conversation across a crowded tavern, as well as reading lips. LITIGATION TRICKSTER: This skill includes an intimate and thorough knowledge of the laws, of all grades and classes, and the ability to defend oneself using the law or to prosecute (or persecute) another using the same laws. This skill is also very useful in navigating and understanding bureaucracies so common in cities and Lawful realms, though Decipher skill might also be required to cut through arcane terminology. This skill also subsumes some oratory skills, but use of Bluff or Intimidate are required when the laws really are not with your cause. LOCKSMITH: Successful use of this skill allows the Thief to identify the quality of a lock, pick a lock, repair a lock, manufacture a new lock, make a lock that looks complex but is really simple, make and modify keys, and guess the proper key for a lock from a large ring of keys in a short matter of time. With experience and close study, the Thief can even identify the maker of a specific lock, knowing thereby certain weaknesses and likely combinations between the lock on the chest and any potential traps included therein. POISONS: This skill allows a would-be assassin to safely handle, identify, and brew poisons and antidotes. The skill is not as thorough nor as in-depth as that of true Assassins, however, and proper handling of poison is never assured; however, whenever the Thief might poison himself through mishandling or the fumbling of a weapon, he can make a Poisons check to negate the effect. Note that secretly insinuating an ingestive poison in a drink requires successful use of both the Poisons skill and the Slight-of-Hand skill! Special: At skill levels of 90, 95, and 99 each, the Thief may choose one poison against which he gains immunity. PUZZLES: This skill applies to solving mental puzzles, such as riddles, mazes, the proper order of pushing of buttons and pulling of levers, special oddities, and all other non-script and non-cipher puzzle solving. SAP: This skill allows the Thief to “backstab” a target with a blunt weapon or object (a sap, club, staff, rock, etc.) with the goal of knocking the target unconscious directly rather than causing lethal damage. First, the Thief must make a successful backstab attack with the blunt object. Damage dealt is subdual only; if the target is still conscious after application of subdual damage, the Thief makes a Sap roll; if successful, the target must make a saving throw against Death Ray or Poison, with a penalty equal to the damage dealt or the Sap roll (whichever is higher) and a bonus equal to the AC value of any helm worn (i.e., a Plate-quality helm gives the target a +6 bonus to his saving throw). If the save fails, the target falls unconscious. SCRUTINIZE: This skill subsumes all sorts of searching, spotting, double-checking, sighting, noticing, and other forms of visual observation and perception. It is used to find traps, spot pits, detect secret and concealed doors, and otherwise visually determine the true status or nature of a physical object or area. 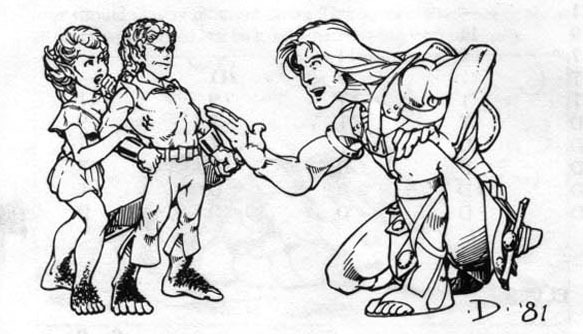 SLIGHT-OF-HAND: This ability includes small acts of prestidigitation, cutting purses, lifting kerchiefs, picking pockets, and manipulation of fine objects with the fingers. 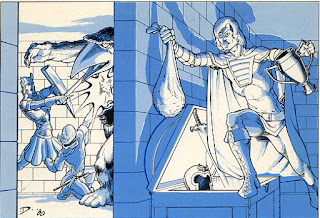 This skill is modified by 5% per level difference greater than 5 levels between the Thief and the target; toward the Thief’s favor if he is of higher level, against the Thief if the target is of higher level. STEALTH: This is the ability to move silently; it is usually used in urban, rural, or dungeon settings. Use in wilderness or cavern settings is at half normal chances, at best. Movement is limited to half normal Speed for best chances; half the skill chance if moving more than half normal Speed up to full Speed, and quarter chances for movement from full Speed to double Speed; it is impossible to use Stealth at faster Speed rates. TRAIL: This ability enables the Thief to find and follow a target unseen through a generally urban or, at best, rural area. The more deserted the streets and wary the target, the more difficult the use of the skill. Disguise skill can be of great help in trailing a subject, as can Hide and Stealth. TRAPSMITH: This is the ability to manufacture or disable traps of all sorts. Lack of the proper tools makes this quite difficult, if not impossible, depending on the nature of the trap. This ability also subsumes the ability to find traps at half its normal value, rounded down, if such skill level is greater than the Scrutinize ability of the Thief. Hexcrawl Wisconsin -- AKA GaryCon! I will be attending GaryCon this year, finally, again, though only for one day -- Saturday. I hope to arrive by 9am. My day is essentially open until 6pm, so I mostly plan to hang out in the Exhibitor Hall or catch seminars or short game demos until 6ish. 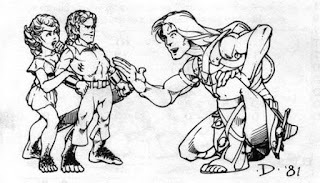 Then at 6pm I will be running a BX/Labyrinth Lord/House-rule game in the Open Gaming area. It's an open-ended game, no limits to the number of players, so if you are there, jump on in, I will have plenty of pre-generated characters. Those of you who look very closely at the arrangements of the ruins that make up the Dungeons of the Dragon-Lords may realize what existing adventure module I am using for the dungeons. I should note that as usual, I am not necessarily using everything in the adventure module, though I am using the maps and select elements, combined with select elements of the original adventure that inspired the published adventure. 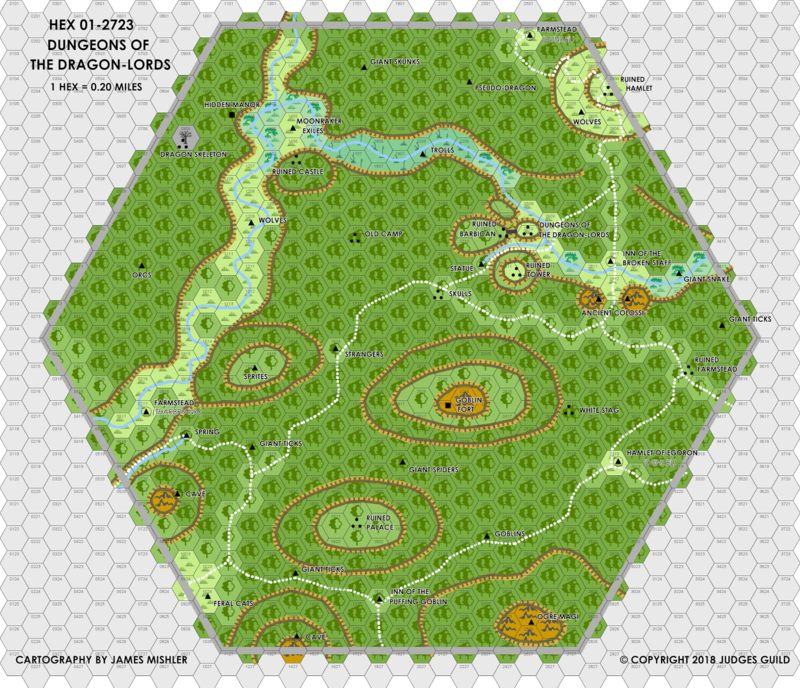 The first person to correctly post in the comments the name of the published adventure module being used wins a free 5-mile hex map of your choice. 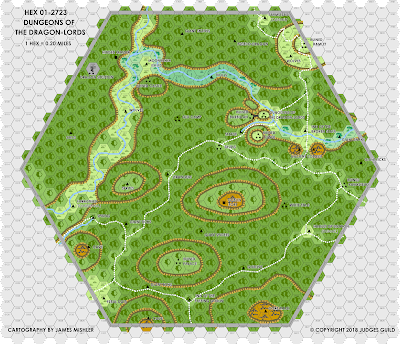 You can choose one of the Wilderlands hexes from any region or even draw up your own for your own game, complete with ideas and/or details of what you want to see in the hex, and I will create a map for it in Hexographer.